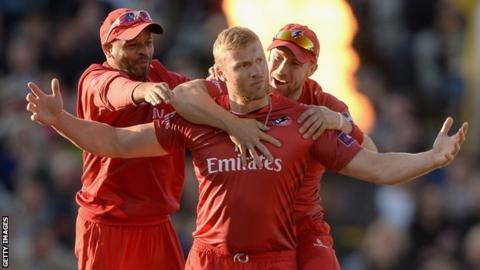 Andrew Flintoff will not play for Lancashire in the T20 Blast this summer, cricket director Ashley Giles has told BBC Radio Lancashire. "We've agreed the best way forward is for 'Fred' to concentrate on the non-cricket stuff he's doing," said Giles, his former international team-mate. "He's always welcome here but I don't see him playing." Flintoff played three T20 Blast matches for Lancashire in 2014, taking six wickets and scoring 21 runs, and appeared in their final defeat by Birmingham Bears. He then joined Brisbane Heat for the Australian Big Bash T20 in October. Flintoff, who played 79 Tests for England before retiring because of persistent injury problems, won the Australian version of 'I'm A Celebrity.. Get Me Out Of Here!' earlier this year and is embarking on a comedy tour of the UK this summer.